Have you wondered what those cool three-wheeled cars you’ve seen around the Outer Banks are called? Well, you’ve come to the right place to learn more… those fun three-wheeled cars are called Scoot Coupes! 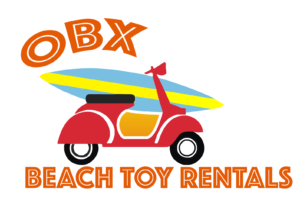 And, OBX Beach Toy Rentals is the exclusive Scoot Coupe rental location for the Outer Banks. Spend an hour, a day or a week driving around the Outer Banks in an open-air, three-wheeled vehicle from OBX Beach Toy Rentals! Scoot Coupes are actually scooters, but they look like a fun little beach buggy. Because they have a gas-powered 50cc scooter engine and reach speeds of up to 35 mph, they are street legal, and anyone age 18 and older with a driver’s license can operate them on local streets. And because they come in bright colors and are open air, they are a blast to drive. Most people rent them simply for fun, but they are also a functional mode of transportation with a storage glove box and trunk. Scoot Coupes are very simple to drive and there’s no need to worry about balancing. And with seat belts and roll bars, they are completely safe. In fact, Scoot Coupes have been rented in multiple countries around the world for the past 12 years! OBX Beach Toy Rentals offers hourly, daily and weekly Scoot Coupe rentals, with no mileage restrictions. Hop in a Scoot Coupe and your mood and attitude will instantly change as you cruise around the Outer Banks. Do we even need to say that kids love them? They are a great and safe way for the whole family to have fun! We have lots of flexible shorter term scoot coupe rental options if you just want to explore the Outer Banks for a few hours or the day. A great way for the whole family to have fun! Our most flexible option. Rent a scoot coupe for a few hours, and add more for just $29/hr. Rent a scoot coupe for the entire day! A great deal! If you’re looking for an alternative mode of transportation for your Outer Banks vacation week, a scoot coupe can be a lot of fun! Enjoy a scoot coupe for the entire week of your vacation!